I have a lot to be grateful for with my job and family. They keep me busy, teach me, and make me happy every day. 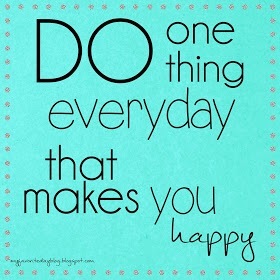 It’s equally wonderful, when I can steal a few minutes at the end of the day to do something that is just for me. And that something is usually something creative – sewing, cutting, gluing, or writing about my projects for Jewels at Home. For those times when I need a little getaway, I love my creative retreat in the top corner of our house. A lot of really fun projects have been cooked up in this space. 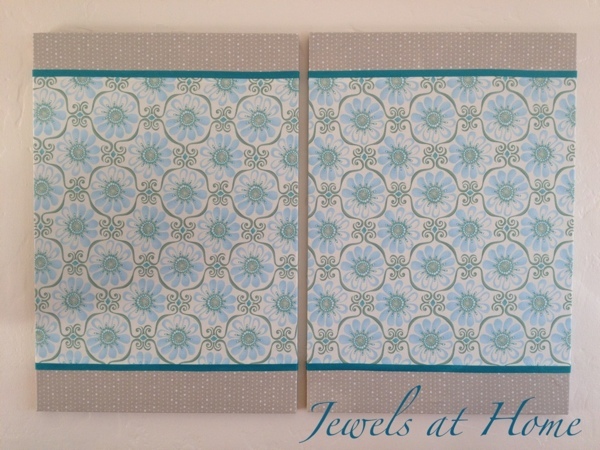 Did you stumble onto my blog through one of my DIY creations? Well, I’d love to show you where it all happens! So, I’m lucky enough to have this room to myself for the moment, until the little boys decide they don’t want to share a room anymore. For many years, we had our guest room in my studio, and that worked quite well also. We used a twin-sized daybed that didn’t take up much space, and there was a pop-up trundle that could be used to create a king-sized bed, when we hosted a couple. 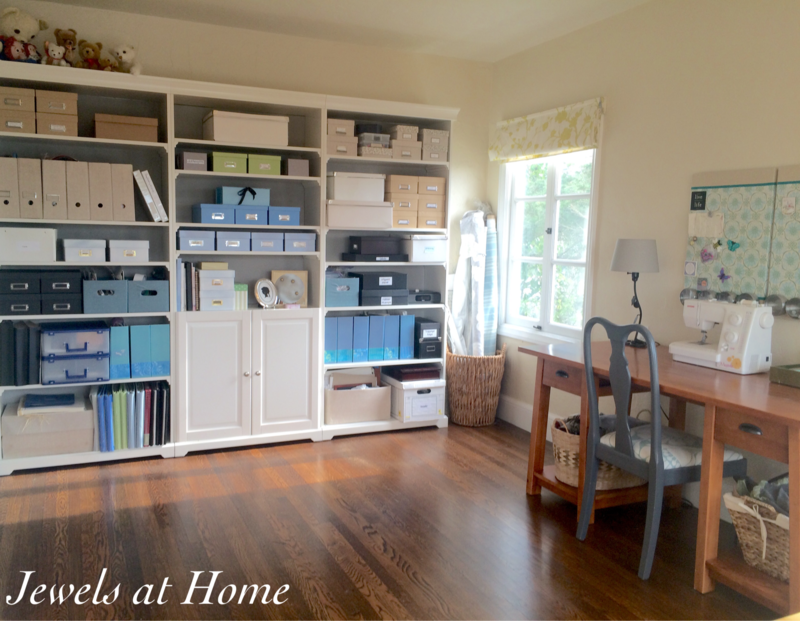 Whether you have a whole room or just a corner for your projects, efficient storage is a must. If you only get a few minutes in a day to work on your favorite projects, you don’t want to spend the whole time looking for your supplies! Most of my supplies and projects are stored on these Liatorp bookcases from IKEA. I lined the back with a roll of gray sketch paper for a cleaner look. These IKEA Liatorp bookcases fit together neatly and hold lots and lots of supplies! I have lots of small boxes and baskets to hold different materials, and they are all labeled, to make things easy to find. These Nickel Plated Card Holders are a big help! Want more storage ideas? That’s a wicker laundry hamper in the right corner holding bolts of fabric. There’s more storage hidden in the big IKEA Pax closets we built in to the room (more about those in this post). The closets in this room, and all our bedrooms, are IKEA Pax units framed and built into the wall. There’s tons of efficient storage inside! 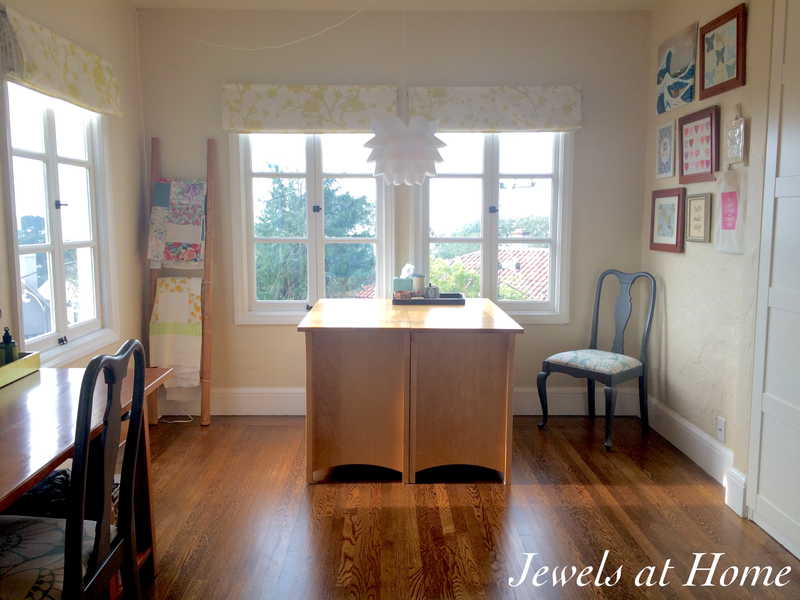 I have two work surfaces in the room – a desk for sewing or working on the computer and a big project table I created using the boys’ old dressers. 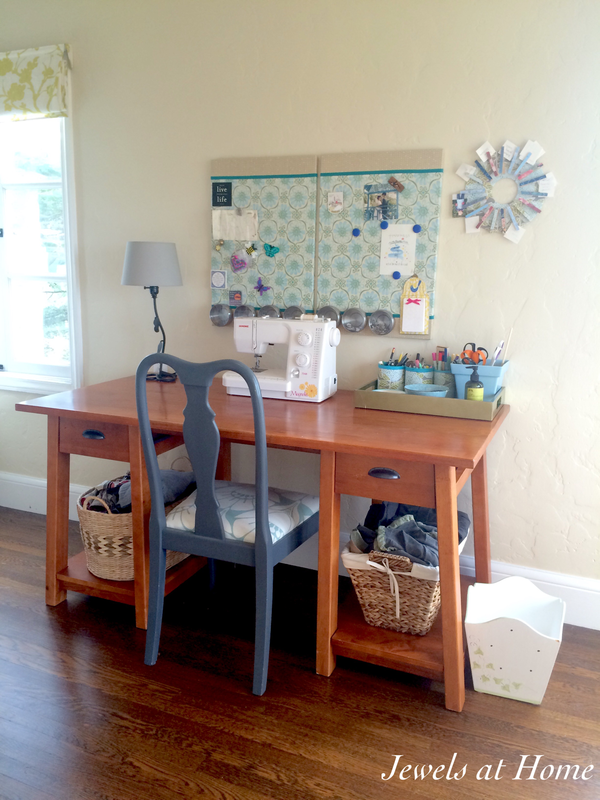 I should actually say I have three work surfaces, since a lot of big projects like quilts are done on the floor. When we moved in, I was looking for a rug for this room, and now I’m glad I don’t have one, since I work on the floor all the time. I needed a lot of light in this room to help me work and also take photographs of my projects. The windows on two walls are a great source of natural light. 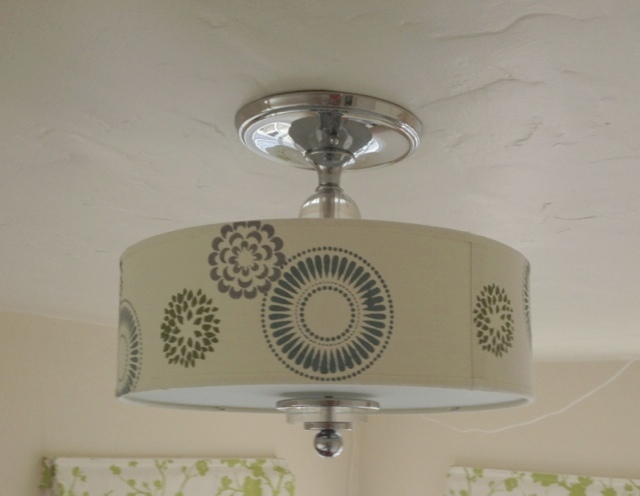 There is just one ceiling light fixture (you can see how I stenciled the shade in this post). I added this plug-in Ikea Knappa Pendant Lamp over my big work table, and a little desk lamp also. 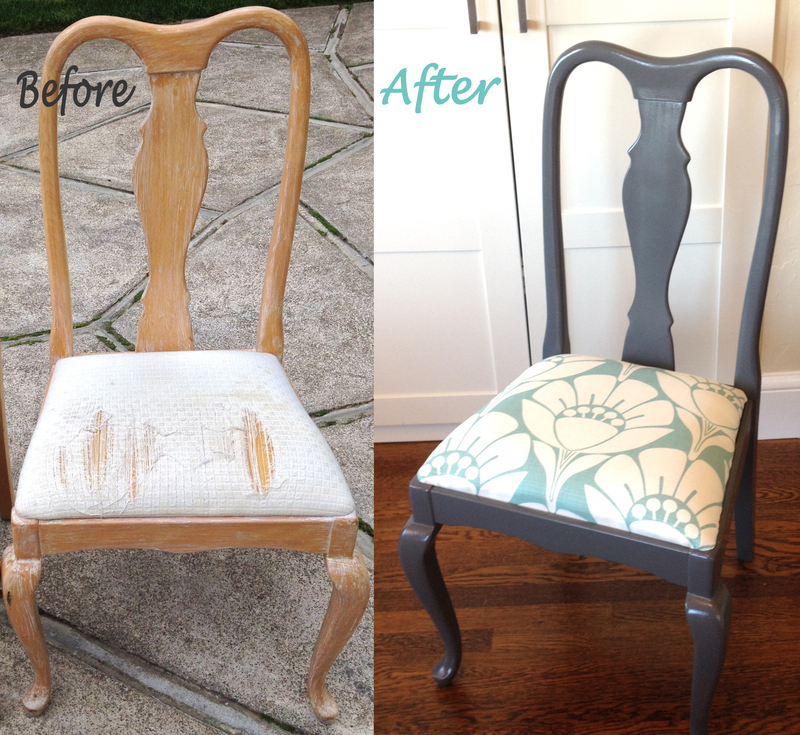 The old Queen Anne chairs I painted and upholstered have a fun retro floral print. These fabric-covered magnet boards contain all the colors of the room. 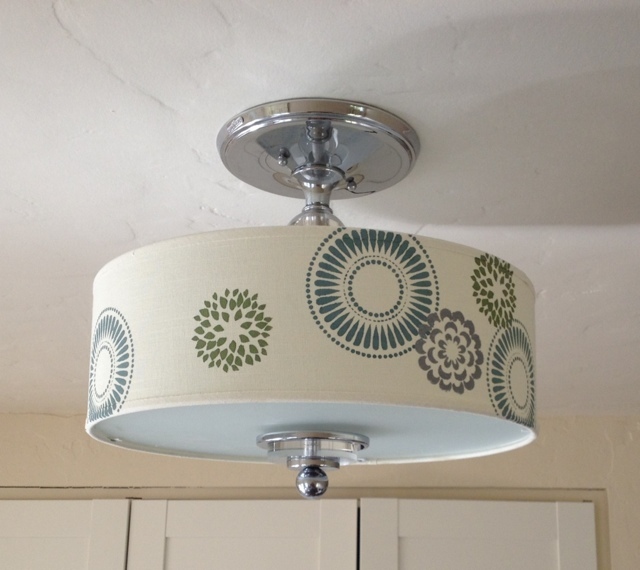 And the light shade I mentioned fits in with the rest of the room’s colors. 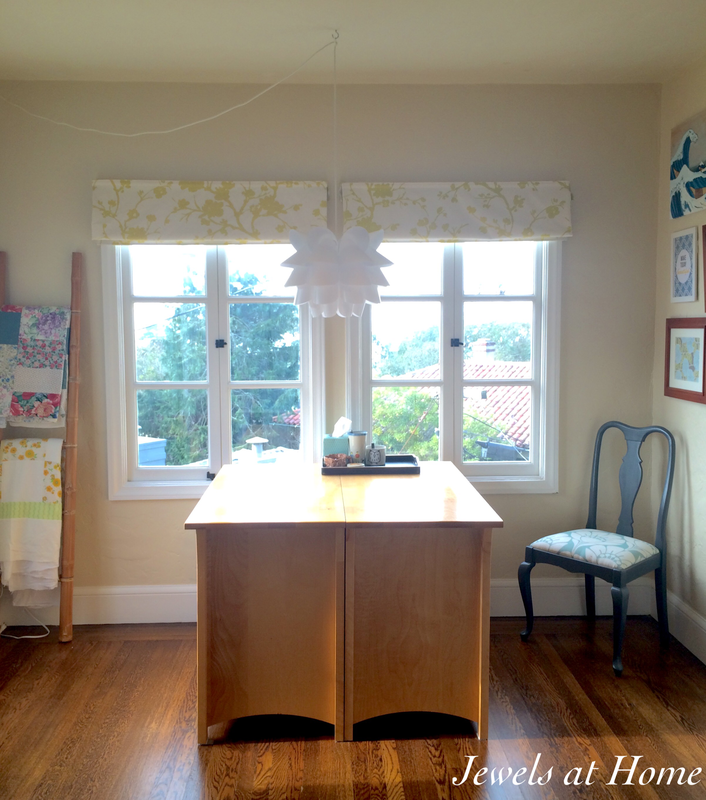 The roman shades, with their green floral print, were sewn by Liz at SFSeamstress. She’s so talented and even managed to rescue a few pieces of this fabric that I had started cutting for another project. Magic! I love so many parts of this space. Since I’m in the southwest corner of our home, I even have great views to inspire me, including sunsets like this one! I also like having the magnet boards to keep ideas easily visible. 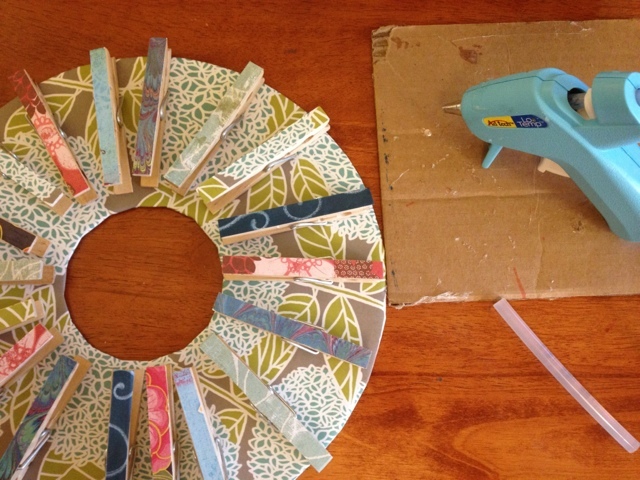 I use one of my clothespin wreaths to keep a list of to-dos. The bamboo ladder in the corner is a good place to display a quilt-in-progress. I have a little inspiration wall in the corner, including paper art projects that I made and a cute printable from Isn’t That Sew. In another nook, I get inspiration from my wonderful family. My mom made this quilt for my birthday one year. 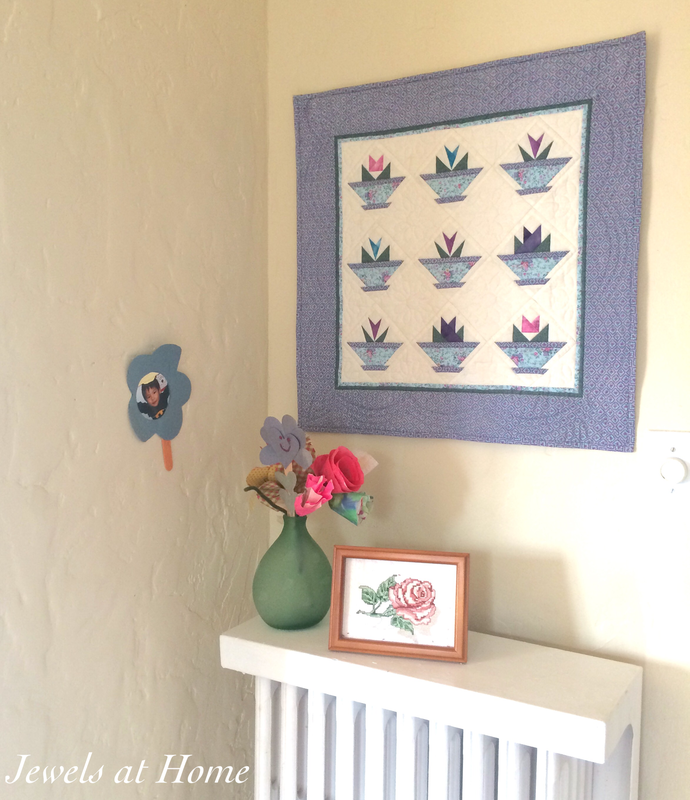 The cross-stitch is from my sister-in-law, and the paper flowers are gifts collected over the years from my boys! Ready for a final look around to see how all these elements come together? I am really, really in love with my workspace! Is there anything else I could ask for? Some more company! For Christmas, my oldest gave me a “coupon” for a day spent doing crafts together, and I am looking forward to that! I’m also planning to start a “Creativity Circle” with some friends this year. I’m thinking we can have an activity each month – some girls’ nights in, some art shows, some classes. All of us are working professionals, moms, or both, and we could use some time to connect with our creative sides, and each other. This is my studio, but I love curling up in other parts of the house, too. Steve has an office in the basement, and for him, the quiet spot, sheltered from the hub-bub of the day, is just what he needs to get his work done. If you don’t have the space in your home, or you need to separate home and work, there are lots of options for artists and entrepreneurs to join a shared work space like WeWork. Where do you like to work?